You and your friends against the deadliest killers in the galaxy. Another glorious day in the Corps. Buckle up, soldier! Welcome to Aliens™: Colonial Marines. Created by Gearbox, the critically acclaimed and fan-favourite developers of Borderlands and Brothers In Arms, you and your friends will become the most badass military outfit in the galaxy – the US Colonial Marines. It’s up to you to not just survive, but wipe out the Xeno infestation. 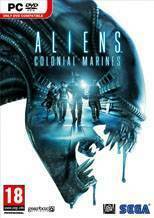 There are no comments yet about Aliens Colonial Marines . You can be the first one!